Posted on October 20, 2010	by Lou Murray, Ph.D. I didn’t think I was going to have a harvest this week other than a green onion, but then I ended up raiding the garden for dinner on Sunday. We had Mussels Mariere with linguine and heirloom tomato salad. The lemon and parsley went into the mussel dish and the basil went into the tomato salad. 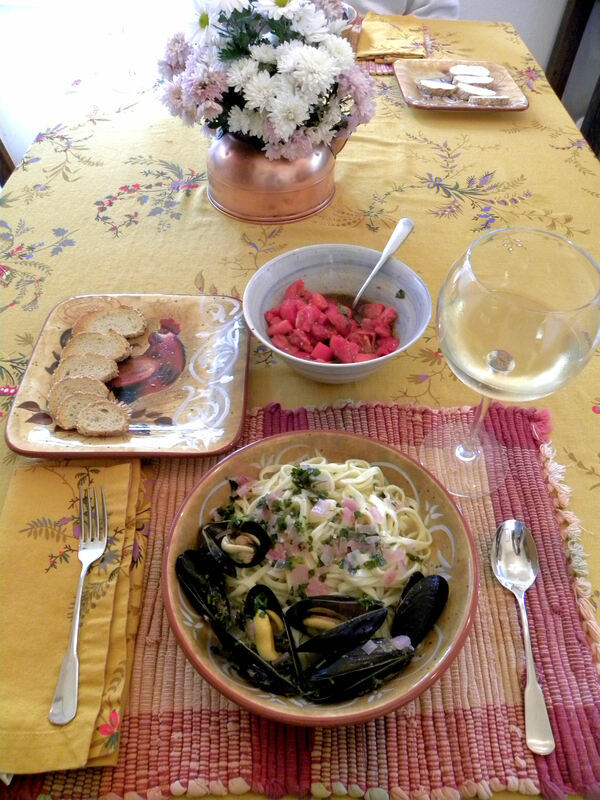 Linguine with locally aquafarmed mussels, bread, and heirloom tomato salad made a dinner. The mussels were locally aquafarmed in Carlsbad, CA, and were terrific. I sauteed some torpedo red onion (1/4 C) and homegrown garlic (3 cloves) in olive oil and butter in a heavy skillet, then added 12 mussels, a cup of pinot grigio wine and zest and juice of a lemon (my first Eureka lemon of the season). I covered the pan and simmered the mussels for 4 minutes until they opened. I added chopped parsley and poured the mussels and broth over fresh linguine in a bowl. The bread was used as a sop for the broth. Heavenly! Oh my, we’re certainly winding down on harvest season. Even the chickens have quit laying. Visit Daphne’s Dandelions to see what others are harvesting. That sounds delicious. I love mussels though I rarely eat them. Usually only when I go out. Daphne, those mussels were fabulous. I plan to make that dish for company some day. The linguine looks good, where did you buy the aquafarmed mussels? I’ll be going home to OC next month, maybe I can cook some for din din. Mac, I bought the aquafarmed mussels at Whole Foods Market in Huntington Beach at the Bella Terra mall at Beach and Edinger. You could contact the farm to see where else they might be sold. Glad you liked the mussels! I am a bit mussel picky (loved them in Long Island and Holland, not so much here.) I saw them on the WF tour and was hoping someone else would try them first. Cathie, give these mussels a try. I’m generally not a big mussel fan, but I’ll eat green-lipped mussels from New Zealand. These were even better.